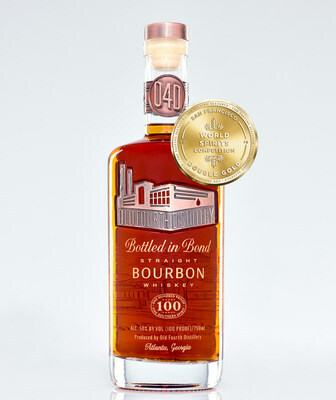 ATLANTA, April 1, 2019 /PRNewswire/ -- With it's first-ever Bourbon offering, Old Fourth Distillery www.o4d.com won big at the San Francisco World Spirits Competition, taking home a Double Gold for the Bottled in Bond 4-Year Single Barrel Bourbon. Released in late February 2019, the craft bourbon was aged in a small warehouse in East Atlanta is the first bottled in bond bourbon produced in the city in over a century. Old Fourth Distillery's Bottle in Bond Bourbon was a standout for the panel of over 40 judges that tasted over 3000 spirits during the 3 day competition. The San Francisco World Spirits Competition is the largest competition in the world, with entries and judges from around the globe. "We're really proud of this one-of-a kind whiskey – it's an example of what's possible in the city of Atlanta," said Jeffery Moore, co-founder of Old Fourth Distillery. "It's an amazing feeling to craft and nurture this dream into a delicious, complex spirit. I love it, our friends love it, our customers love it, and evidently, the experts do too." Old Fourth Distillery also took home a Gold Medal for the brand's signature Gin at the San Francisco Competition. Old Fourth's Southern Dry Gin won the award despite a crowded field of over 300 entries in the gin category. "Our Southern Dry Gin has an amazing citrus-forward blend with really interesting spice notes. We use pink peppercorn, cardamom, coriander and even juniper berries from Atlanta's historic Oakland Cemetery," said Moore. The win marks the first time an Atlanta-made gin has garnered a medal on the international spirits stage. About Old Fourth Distillery: Founded by brothers and Atlanta natives Jeffrey and Craig Moore, Old Fourth Distillery Launched in 2014, with a founding purpose to make the world's finest spirits from the best ingredients available, using both cutting-edge technology and centuries-old traditions. 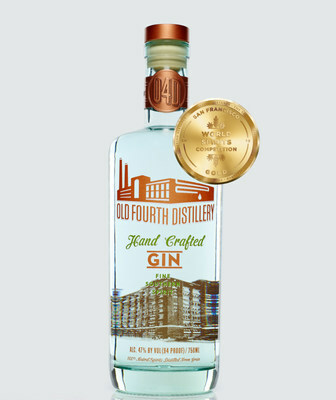 Old Fourth Distillery Gin has won Silver for the past 3 years, 2019 took home gold at the San Francisco World Spirit Competition.